Need to check if crowdsourcing is one word or two? Now you can look it up in the Oxford English Dictionary (OED). The iconic reference book has released a list of words that are being officially added into the English lexicon, which includes some popular tech jargon. 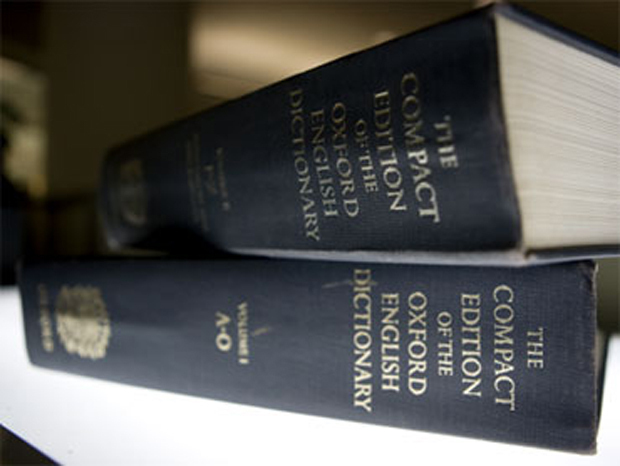 Words like "live-blogging," crowdsourcing" and "mouseover" have been added to the 2013 OED. The dictionary acknowledges that it is breaking its own rule that a word must be "current for ten years" before it can be included into the dictionary, by expanding the definition of "tweet." The modern use of "tweet" was not popularized until the micro-blogging service Twitter launched in 2006. Its original definition of a sound that a bird makes remains intact. Other words added to the dictionary include "flash mob" and "geekery." Interesting non-tech words include "handy-dandy," "heart-stopping" and "mani-pedi." Over 1,200 new words have been added to the OED for a total of more than 823,000 entries. A full list of new words added in June 2013 can be found on the dictionary's website. 2. a.To make a posting on the social networking service Twitter. Also: to use Twitter regularly or habitually. 2. b. To post (a message, item of information, etc.) on Twitter. Also: to post a message to (a particular person, organization, etc.). The practice of obtaining information or services by soliciting input from a large number of people, typically via the Internet and often without offering compensation. The action of moving the pointer on to an element of a graphical user interface or web page; an event (esp. a visual change) triggered by this.